The Thursday before the wedding it was beautiful & sunny. A little chilly but not a cloud in the sky. I met up with Heather, Eric, and their Coordinator to do a walk through of all that would take place on their Big Day just two days away! 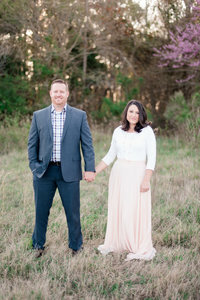 They planned to have their wedding at their Church Calvary Assembly of God. The church is on a beautiful waterfront and has hosted many weddings in the past. The property was GORGEOUS. We walked through and planned where we would do the first look, where the bridal party pictures would be and all the other little details. They had put a lot of work and thought into this day and we were all excited to see everything come together. As I am sitting here typing this blog. The sun is shining and the sky is clear and blue. However, on Saturday when we awoke… There was no hint of any sunshine. The clouds were dark and rain was falling. Everything had to be brought inside. The plans had to be changed. You would have thought there would have been some tears and complaints. ( And maybe there were ) However, when we arrived Heather was as happy as she could be. Glowing and Radiating of happiness. Eric was nervous and yet excited. And they were surrounded by their friends and family who were working their tails off to make everything run smoothly. The setting was beautiful. Their loved ones did such an AMAZING job bringing everything together. And yet what was more beautiful… Was the ceremony. Their vows, their parents prayers over them, and the stories that were shared. That is what was beautiful and what I will remember most about these two. Despite the last minute change of plans… These two went with it. And that is what life is all about. There will be times our plans will not go as planned… However, our attitude and our focus on whats most important will say so much about us and will determine our happiness. These two were so very happy! And Luke & I are so very happy for them! We cannot wait to hear stories and watch them grow as husband and wife… And even start a family together! These are fabulous guys!! SO happy you two were the ones to document the day!